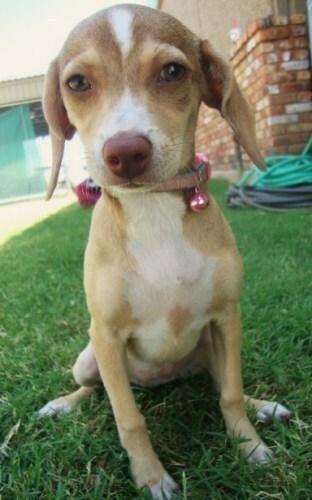 Philly is a 4 month old tan & white chihuahua/dachshund mix. Philly is a sweet little girl that when you pick her up all she wants to do is give you kisses and cuddle. Philly we rescued from the shelter and we have no idea why someone wouldn’t want a dog as cute as her. Philly gets along great with kids, other dogs, and just about everything and everyone she meets. Sometimes she maybe a little shy but once someone is holding her and showing her love she opens right up. Philly is also crate trained, comes up to date on shots, spayed, microchipped, and current on heartworm preventative. Philly is looking for her forever home where she can just cuddle up with her owner and watch a movie. If one is interested in adopting Philly please fill out a application by clicking the link at the top of her bio. PHILLY’S ADOPTION FEE:$100.00 Reviewed & Updated: 09-12-2010 Philly is exclusively fed Natural Balance Ultra Premium Dog Food!